Cupcake Royale has had a lot going on lately, what with the opening of their beautifully outfitted new location and owner Jody Hall speaking out about Health Care on NPR. But of course we can't forget the cupcakes, and this August they've got a refreshing new flavor: Raspberry Lemonade. 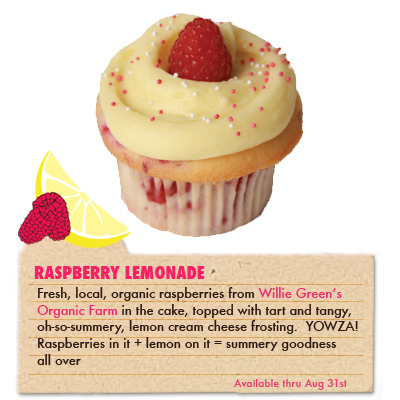 Per their site, the new flavor consists of "fresh, local, organic raspberries from Willie Green's organic farm in the cake, topped with tart and tangy, oh-so-summery lemon cream cheese frosting". I love that the flavor has the raspberries mixed into the cake rather than just as part of the frosting--it sounds so refreshing for the summer heat, but with a welcome bit of richness from the cream cheese frosting. The new flavor will be available at all four Cupcake Royale locations through August 31st; for more information, visit cupcakeroyale.com; for instant updates, follow them on Twitter!